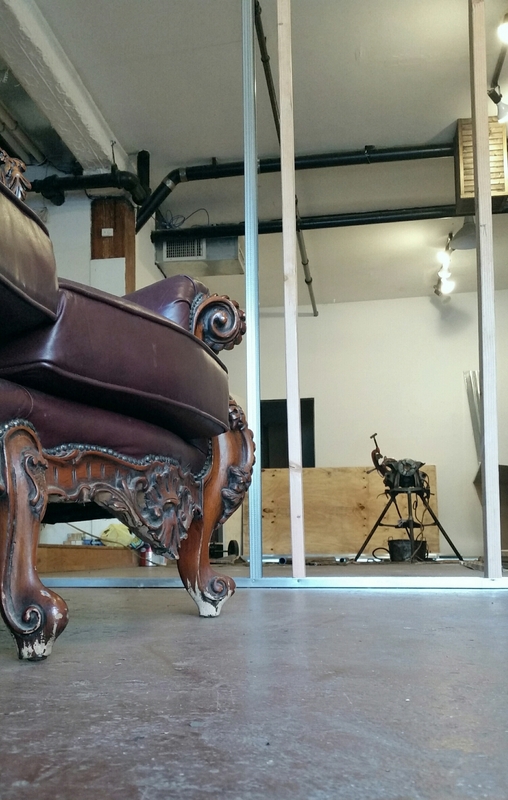 The new space on Varet Street is starting to look like an artist studio now . All the new walls are up and complete , the various studio areas have been defined now . And the retail area has made the greatest progress towards completion in the past few days . Watching Patrick work on the walls of the retail space yesterday was fascinating . The texture he was able to create on the walls exceeded our expectations . The new store will look so amazing with the wall treatment complementing the vintage wood display cases . The textured finish is built up in layers to arrive at the final look . This is a technique that requires skill and knowledge to execute properly . And now a coat of primer , and then the paint goes on . Patrick made it all look easy , it's definitely a skill aquired over time . Dust is everywhere ! Like an old store that has not seen anyone enter in decades . The piano looks like it would moan if you touched the keys . Could we play a haunted melody from a bygone time ? With the work on the walls being done in the last few days there has been alot of dust generated . It's settled on everything in the space , the furniture , the cases , just everywhere . The storefront has the aperance of an old store thats been locked up for years . And we're the first people to step into this time capsule since it's been shuttered . 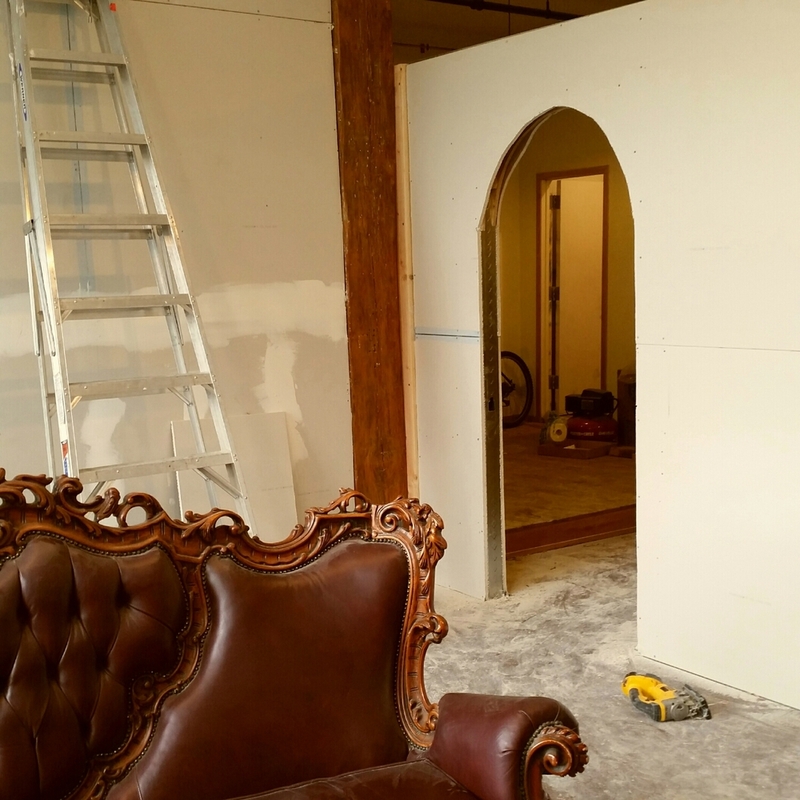 We're excited to see the retail space is starting to look like an actual room now ! Today's efforts are evident in the new walls that define the new store space here on Varet Street . 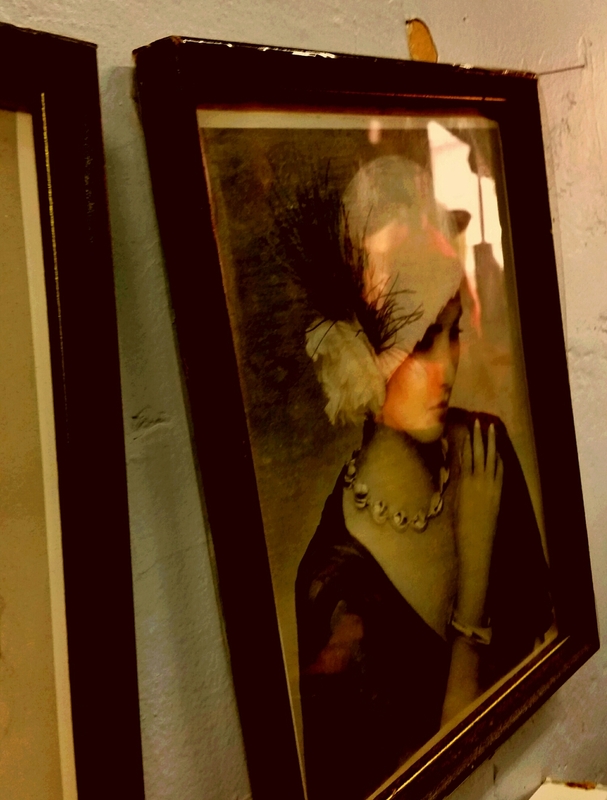 This store is going to be incredibly elegant with a vintage vibe , rich in detail and style . There is still a lot of work that needs to be completed before we can start placing the furniture and display cases . But even at this stage , everything that we've visualized about this new space is falling into place .
. New walls going up , the retail area is start to look like a room . Working on the doorway leading to the workshop . I'm loving the look of the arched doorway and the massive timber next to it ! I love how the random placement of these pieces came together . A good moodboard for the interior styling of the store ! The gradual transformation of this once raw space into our new work space is progressing on schedule ! 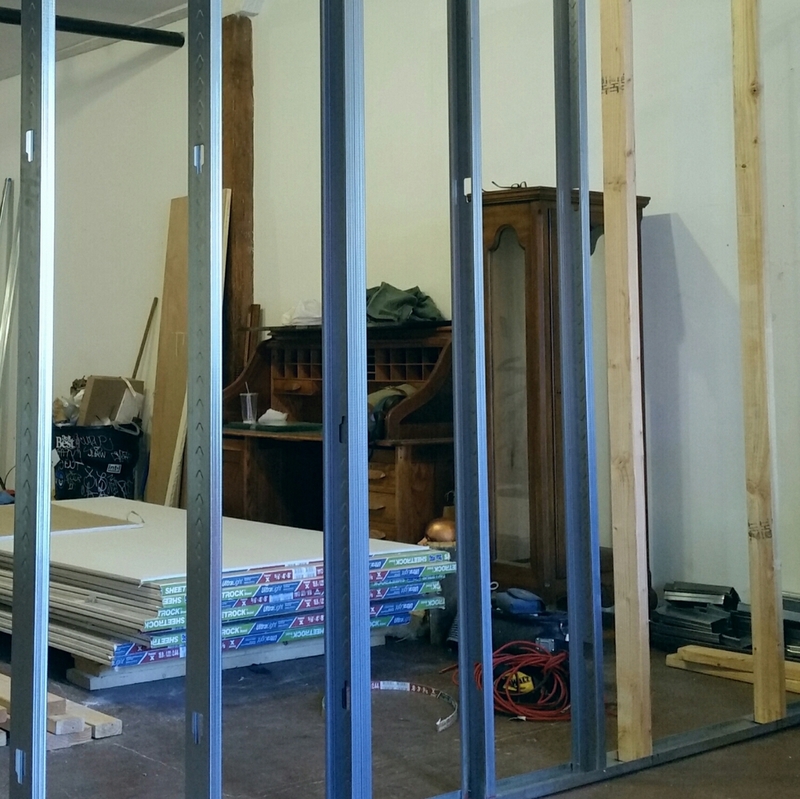 Once skeletal framing has evolved into walls for our new office and jewelry studio . The studio will have more bench space and a larger working area for wood work . The office space is shrinking in size , but will no longer share space with the retail area . The retail area here on Varet Street will be it's own separate space , something we've always wanted . Our old familiar neighborhood , home for so long ! We've been focusing on the retail store here , and are watching the walls go up in our new space . This is a new experience for us , having a retail store front to represent ourselves . Currently we are located on the fourth floor of the building we're in , with a showroom / office space . 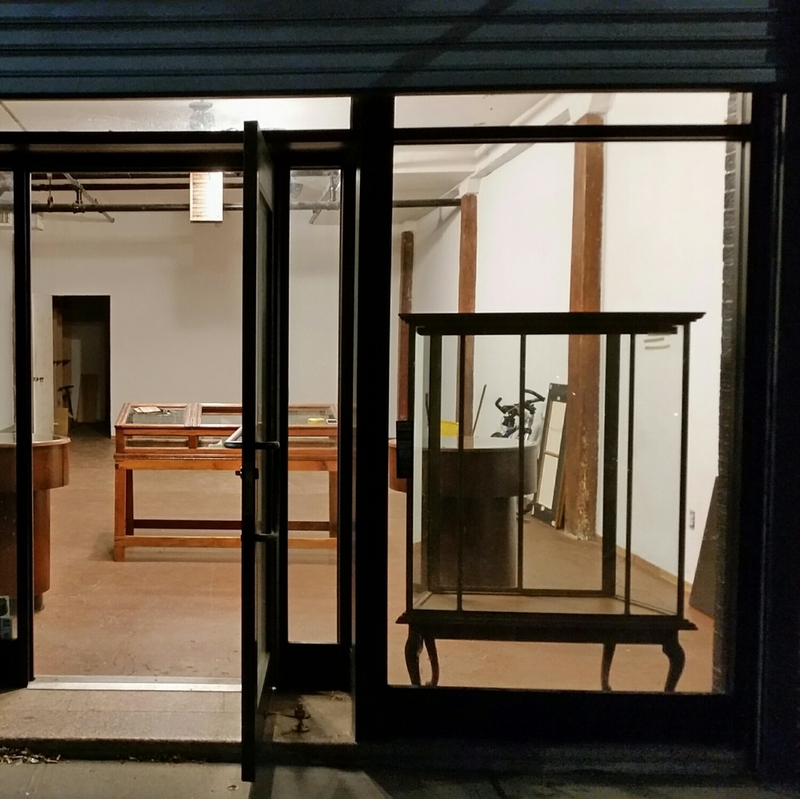 With the move to Brooklyn we will be directly on the street in a storefront location . Which will certainly be different than the current "By Appointment Only" environment we have now ! The appointment based atelier shop was an appropriate adaptation to our location in Midtown Manhattan . 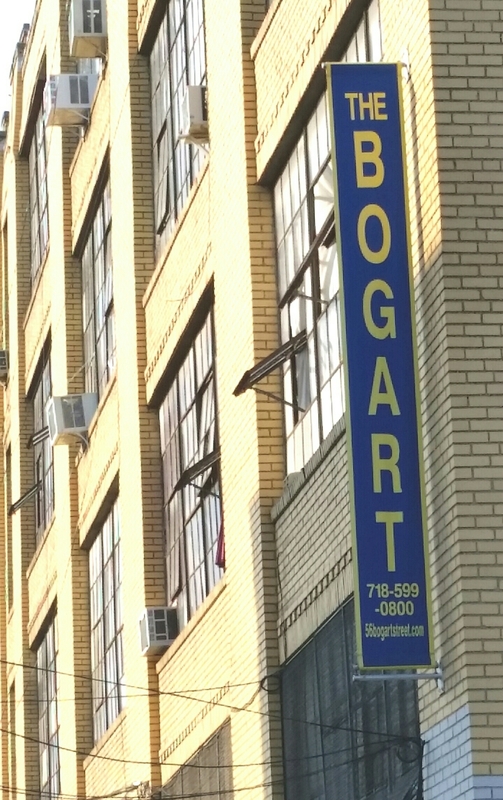 But this new location on Varet Street and Bogart Street is a polar opposite of the present Midtown location . A space with direct access to the street is the ideal vehicle for us on Varet and Bogart in Brooklyn . The streets here vibrate with color , sunlight and energy that permeates the area . So unlike the shadowed corridors of Midtown , that lack vibrancy and creativity . 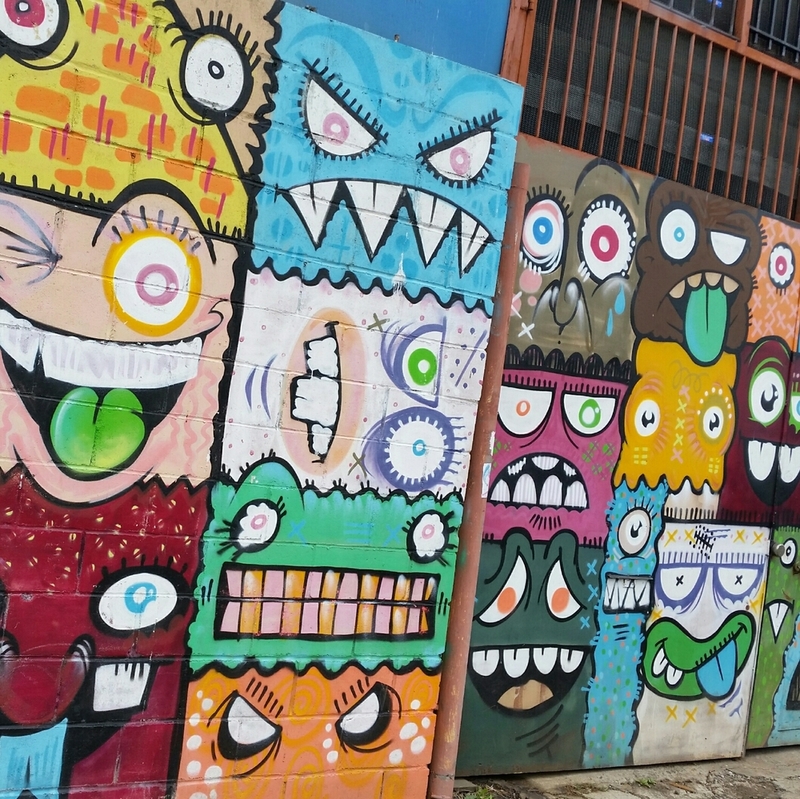 The street side walls of these industrial buildings have been transformed into large scale canvases for street art . The connective walls and fences are like unrolled scrolls displaying illustrated stories . The area is a visual explosion of structure's turned into art installations . I do not think that we will be looking back after the move is complete . Art is where you find it , and it's not necessary to look for it . It's there waiting to find you . On display outside , all you have to do is walk the streets . Does this look like Midtown ? Bushwick : Construction starts today . 30 sheets of 5/8's sheetrock we had to load and unload several times in the course of today's adventures . We've been anxious to get started on the construction phase of the move to Brooklyn . Today is the day that the physical renovation of the new space begins . Yesterday was spent picking up and dropping off the building materials , and finalizing the interior layout . Now it's time to get the walls up so we can paint and then bring in our equipment and supplies . 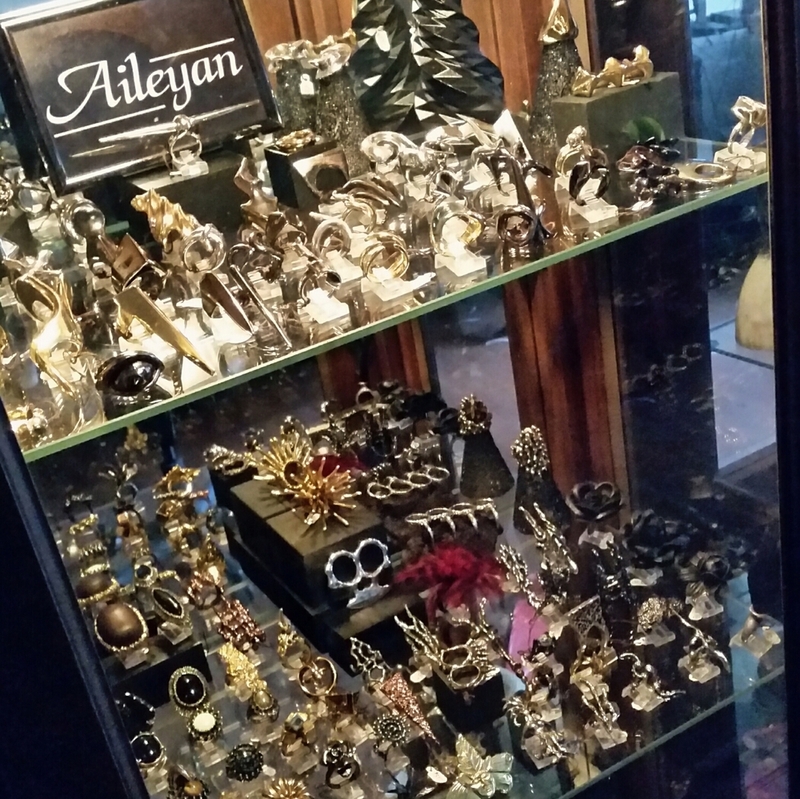 We've brought in several display cases and some props fot the new retail store . And behind the windows of the new storefront the inside space resembles an antique furniture store . Very similar to the shops in the area that are packed with old and antique furniture , industrial salvage , unknown artifacts , and household items from bygone eras . Ocasionaly someone pokes in their head asking if we're opening a furniture or antique store . "No , no furniture , accessories - hats - jewelry ! " "OHH !?!" They say as they take an other look . 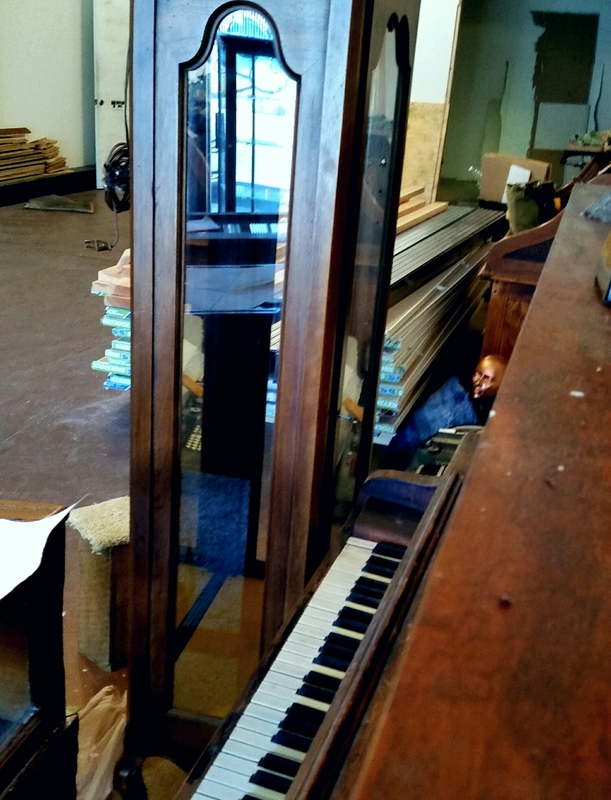 A piano , some display cabinets , what's missing here ? More display cabinets over here , and over there and in between . A blank canvas , that's waiting for something to happen . We've been discussing a floor plan for several days now and are ready to begin . The first step in the planned renovation of our new space on Varet St. The new jewelry workspace will be located in this area . we managed to get this piano out of a Brownstone in the area from an apartment on the second floor . A bit of a struggle , and here it is waiting to go into the shop . Wish one of us could play the piano , a last concert on these keys would be appropriate . 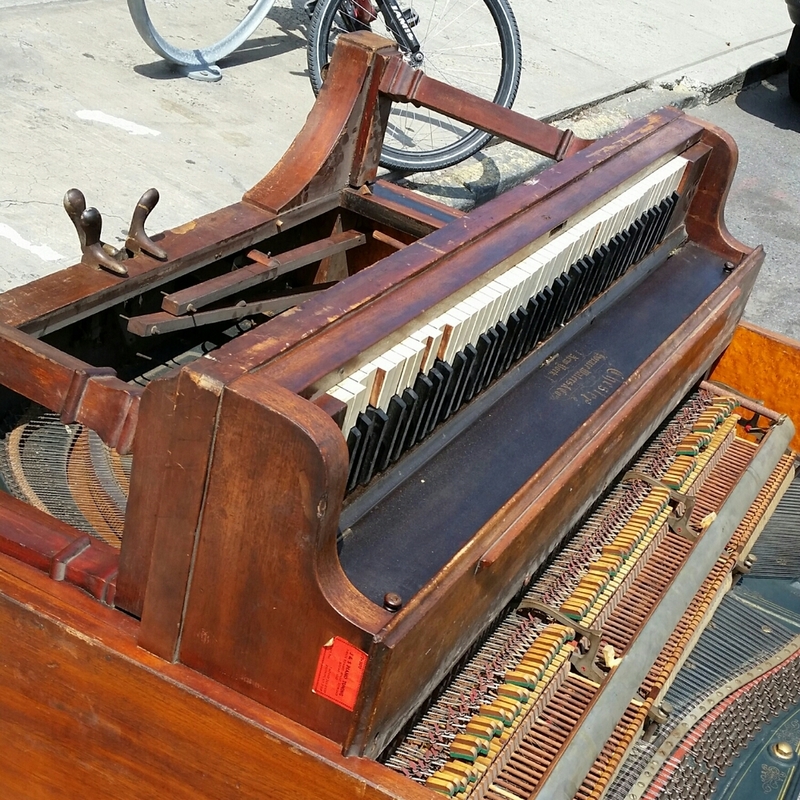 Stay tuned for more about the future of this old Chester piano . 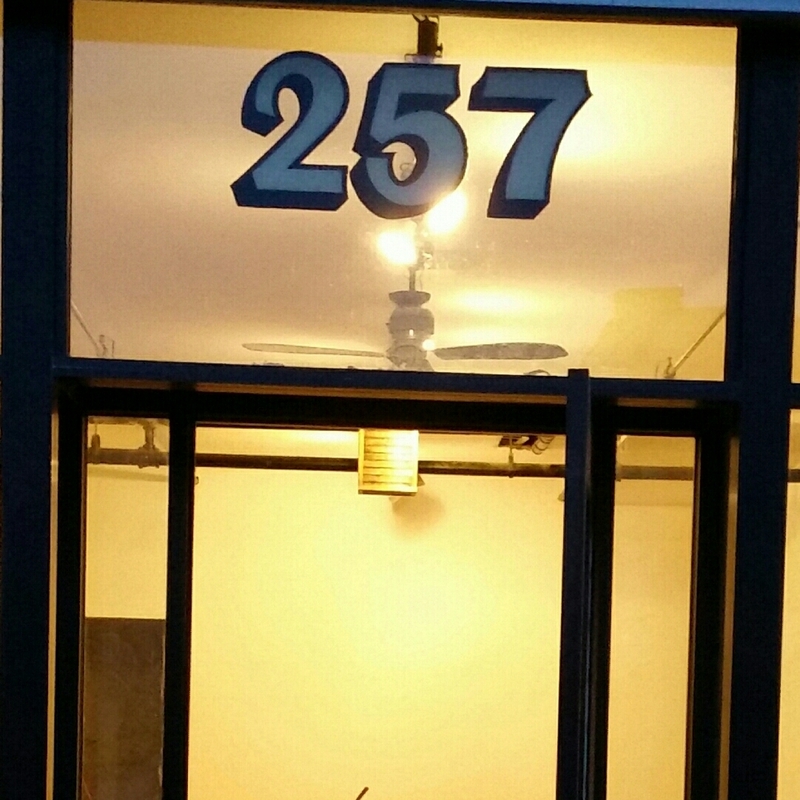 It's official now , with a signed lease and keys in hand , #257 Varet St. will be our new home . The months long search has ended with the discovery of this ideal space . Located in the Morgantown section of Bushwick Brooklyn , in one of the areas converted industrial buildings . This former industrial landscape has been organically evolving into a dynamically creative environment for various artists . We feel ourselves to be very fortunate in finding this space that offers us so much more than we are leaving behind ! A view from inside the new space . There is a lot of work in store for us in the next few weeks . Stay tuned for the evolving make over . Just doing a bit of experimenting with some themes for styling a photo shoot of some of the current collection . I like the way this cast iron hand looks against the firey red background . This is a look I'm going to have to explore further in the future . As we're planning our move to Brooklyn , I can't stop thinking about all the time spent here in this shop . All the years , so many moments in time and the multitude of emotions contained by these walls . So I wonder about the ghosts . There must be ghosts after all these years , decades really . Are there ghosts here , watching us and maybe laughing and screaming with us sometimes ? Or are they those mysterious unexplained sounds we sometimes hear ? Maybe they'll follow us to Brooklyn , instead of disappearing with the rubble when this place is demolished . Generations ago the connection we had with the land and the influence it had on us was lost . America moved from an agrarian economy to an industrial economy , it's society changing with the move . The industrial revolution with its constant technological advances removed the dependance on hand crafted products . Mass production and ever increasing technology displaced craftsmanship and handmade products . Which brought about social and cultural changes as well as economic change . With our present reliance and addiction to technology it would seem craftsmanship should become extinct . But that's definitely not the situation , craftsmanship as a vocation and more importantly as a lifestyle is growing . The phylosophy of lowering production costs to the bare minimum , all so lowered the consumers expectations . For the average consumer , economics and corporate marketing dictated the gradual switch to mass market goods and services . The consumer was eventually left with a narrow field of choices . But the current market created by technology and corporate business serves as a vivid example of why we need craftsmanship . Junk food , fast food , fast fashion and disposable products !?!? Handcrafted in a traditional manner is not just a possible option , it's a way of life . A traditional way of life . Hand crafted means made by hand ! 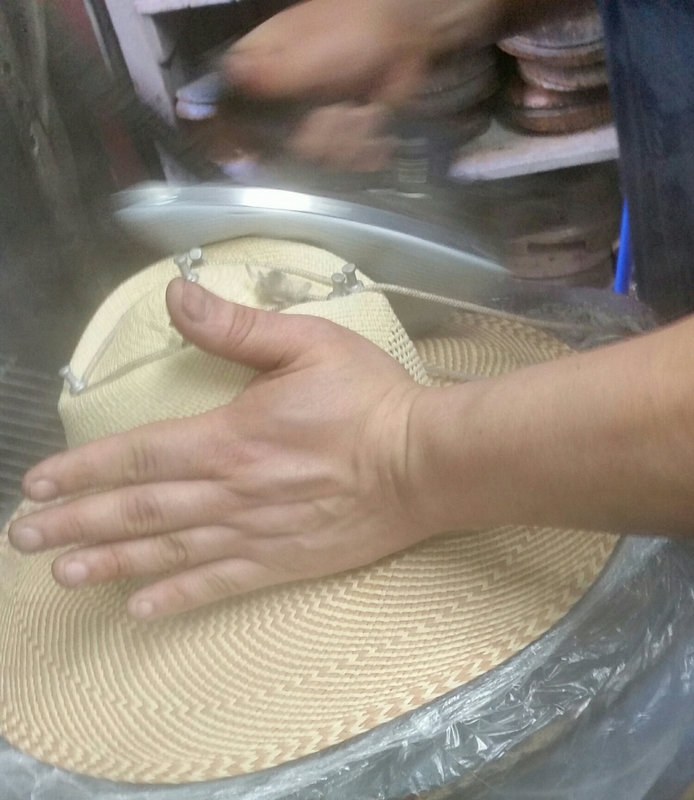 All the hats are formed on wooden blocks by hand , not mechanically . Hand carving the blocks we use to shape our hats . Still being done the way it should be done . Done by hand with skill and care using traditional techniques . Situations are often what you make of them , there is generally more than one way to view any given situation . Even being displaced can be viewed with a positive outlook . In our current situation we are forced to examine and rethink our position and opportunities on West 39th st. We have certainly enjoyed several advantages to being long time residents of West 39th st. We have had one landlord , who had been very fair to us while he owned the building , in this location . And it was always convenient for us to be located close to some of our suppliers . We had become comfortable in our space and the surrounding area . But in retrospect we should have been more aware of our surroundings and the changes that where talking place . Our opportunities here in the old Millinery District are limited . There is little potential for growth open to us in this location . As a craft based shop working in a traditional manner , Midtown Manhattan is the wrong location . The area is dominated by Corporate brands , which have been remaking the way most people shop . And the small shops in the area are increasingly oriented towards the tourist trade . In the long term we would stagnate and eventually be priced out of the Fashion District . Our best option is to leave the Fashion District for an area that offers a creative environment as well as opportunity for growth . 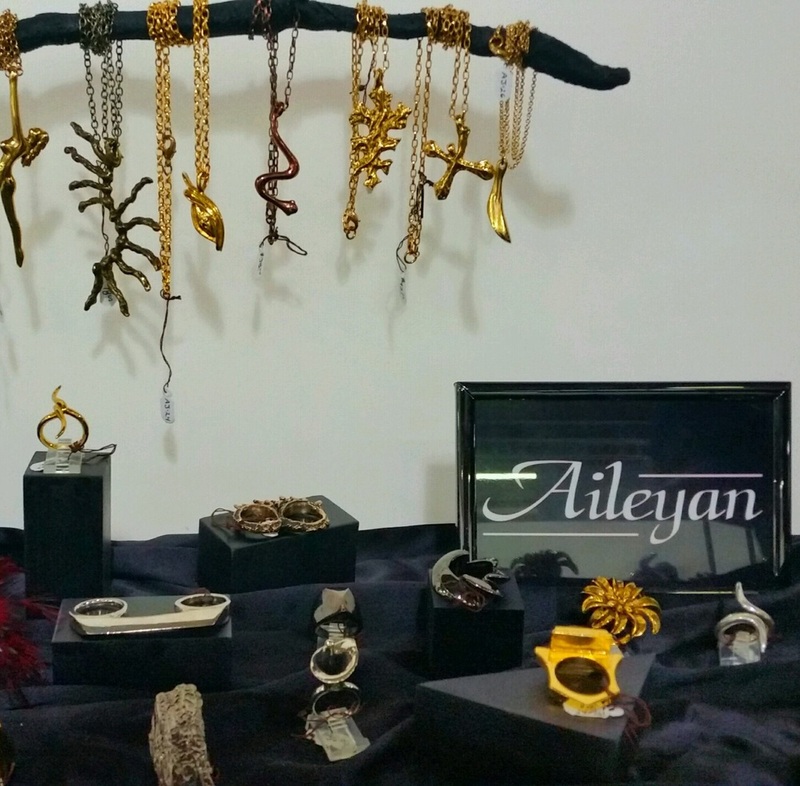 A view of our current collection on display in our in shop show room . Merchandising available up the block from us on 6th Avenue . I think our shopper is a little more discerning than the shoppers we're seeing. on the street here . 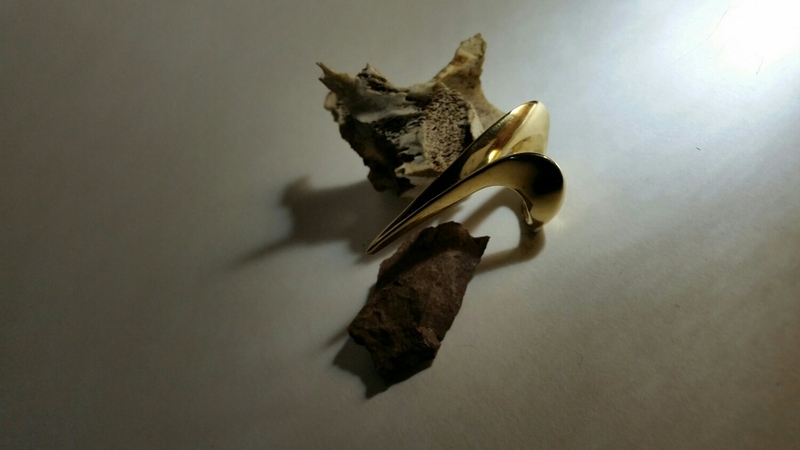 Gold tone ring from our current futuristic themed collection . New York City in the Fashion District. 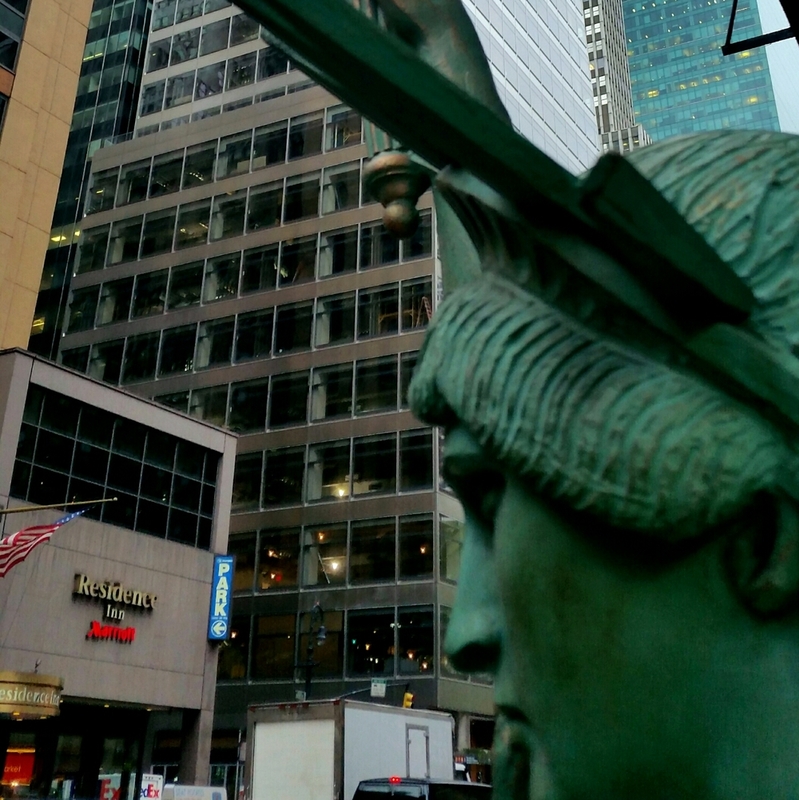 Lady Liberty doing her best in front of a souvenir shop on 6th. Avenue . She's been working hard , there's another souvenir shop on the corner three buildings up from the shop she sits in front of . Perhaps the other shop can hire one of the Times Square costumed characters to hawk the goods . After all this is the Fashion District , costumes would be appropriate . "Give me your tired , your poor , . . . . Give me a hotel room , I'm tired and poor . I've been hustling souvenirs all day on sixth Avenue ." 39th. Street in the Fashion District . Tourism or Fashion ? It would seem that the defining industry of Midtown Manhattan is Tourism ! The re-imagining and consequent reconstruction of Times Square into it's present incarnation has had a far greater influence on N.Y.C. than the obvious Disneyland gentrification of a blighted district . The degeneration of which , was so vividly portrayed by Martin Scorsese in his movie Taxi Driver . The redevelopment of Times Square as a concentrated effort began in 1980 under mayor Edward Koch . In the last days of mayor David N. Dinkins tenure Disney was able to reach an agreement for the New Amsterdam Theater . And under mayor Rudolph Giuliani the pace of law enforcement and development was accelerated . Change became possible though government intervention in the development of the district . Tax breaks were given to developers and tenants , and zoning changes allowed for higher towers .The enforcement of eminent domain and the outright condemning of groups of properties helped move the development foward . The changes had a positive result , tourism increased and so did the city's tax base . And so the stage was set for increased development beyond the scope of Times Square . The increase in tourism , of course required an increase in the number of hotel rooms available . Which is one of the factors affecting our current situation . The fashion industry is in a decline in the Garment Center and the Times Square district is expanding . As fashion related business's leave the emaciated Garment Center they are replaced by non fashion related business's ! 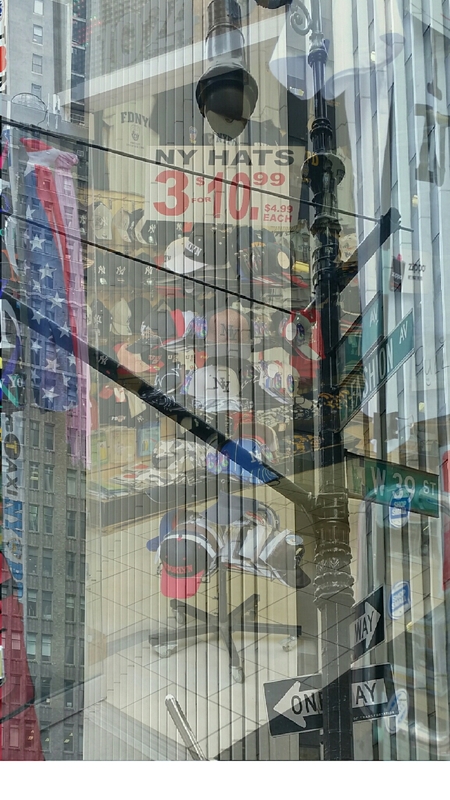 This progression has caused us to rethink the logic of being located in the Garment District . Our original parent company has been located on west 39th. St. since 1957 . West 39th. Street was the Millinery district in the Garment Center , no longer so . So now at this point in time we have to ask "is there potential for growth based on this location" ? The answer is No , there are too many factors that make growth improbable for a small company like ours in this area . A space to relocate to is either too small , to costly , or simply not available in the area . Street level storefront space is astronomically priced , and more importantly our potential customer is not shopping in this area . It took the sale of this building and our impending displacement for us to realize that we no longer belong in the Fashion District . All ways good to be informed !! The view of the sculpture was better before the information booth was added . Though from this angle it makes for an interesting juxtaposition . The future of the Fashion District in New York City . On Fashion Ave in the Garment District . Some 73 hotels are expected to open in the five boroughs in 2016 . With growth based on new construction not expansion ! A view from our roof top , a list of defunct businesses painted on the wall . These old advertisements now serve as a memorial to the old Millinery District . The Fashion District reached its peak by the mid 70's . And as so many other industries in America it went into decline Offshore manufacturing had started to eat away at domestic manufacturing . And as capital moved to overseas manufacturing , less capital was reinvested in the N.Y.C. Fashion District . The cost of manufacturing in N.Y.C. went up , and so there was less incentive to continue manufacturing in the Garment Center . Businesses closed , and landlords converted industrial space to office space . With office space returning a higher rent return per square foot than manufacturing space . The conversion to office space was eventually followed by the conversion to Hotels . With Hotel Rooms bringing an even higher return on investment in comparison to Office Space rentals . So in the further pursuit of higher rents , the amount of available space for shops like ours has declined dramatically here in the Fashion District . Today less than 50 % of the Fashion District tenants are in a fashion related business ! Thoughts on being displaced from the NYC Fashion District. We have been searching for a new location for our shop for about six weeks now. The building we are in has been sold. As an ongoing buisness the company has been here since 1959. Our present location on 39th street in midtown is in what was once the Millinery District of the fashion district of Manhattan, but the Millinery District is non existent now and the Fashion District is very Fragmented and shrinking. For years we have been the observers of the decline of the area in respect to the Fashion industry. With the sale of the building we are among the victims of the downsizing of the New York Garment Center. Our location once part of the Fashion district because it served the Fashion industry is to be replaced by a hotel. Another hotel, to join the existing hotels in the District. Combined with the offices in the area, the Fashion district houses an ever shrinking group of Fashion related business. We are being replaced by another corporate owned hotel. Though we were initially overwhelmed by this turn of events. We've come to realize that Midtown Manhattan has been reshaped into something we are no longer a part of. On a artistic level, our old Neighborhood has little to offer. Midtown Manhattan is just no longer where we belong anymore. We had become comfortable in our own space , And did not really think about the environment outside our doors . 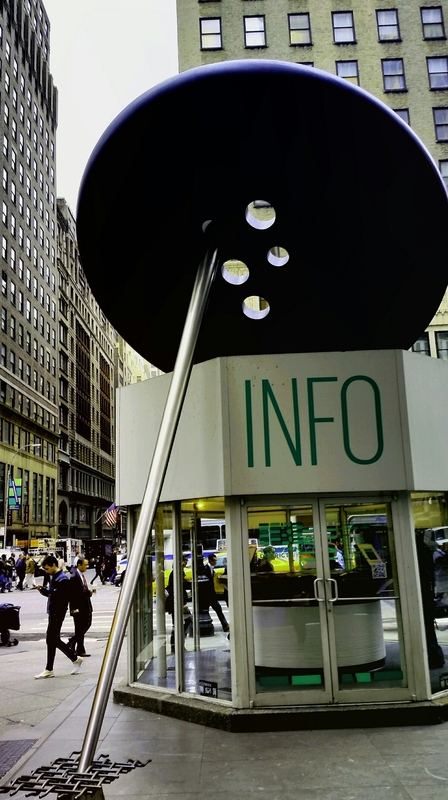 Midtown has grown into a corporate environment , Not a Suitable environment for us . Being displaced has caused us to re assess what it is that we do. This is a opportunity to grow and to evolve into something that could not happen in the shadows of midtown. Midtown Manhattan, the view from rear of the shop twards 38th street. The Capsule NY Womens Accessories 2016 show ended this week Tuesday , and here it is Friday already ! Now that we've been back in the shop for a few days . I can't help but think that the three days at Capsule was like living in an alternate reality . The show environment is so different from the shop , it's such a different routine . The all too familiar office phone ringing is non existent . The sounds and the energy are new and unique to the venue . We were Lucky to have some beautiful and inspiring neighbors in the booths next to us . We are excited to be showing at the Capsule A/W 2016 Women's Accessories show in NYC. There is never enough time, We have been so busy with fashion week and filling orders that preparing for the trade show crept up on us and Now we are one week away from the show dates ! Definitly feeling a bit pressured at the moment , but isn't that the way it usually is . One part stress , two parts excitement add a shot of adrenaline and we're there !